Today’s FoodTruckr Hero earns major points for serving up tasty pulled pork sandwiches and delicious mac and cheese to their most loyal fans—but the real reason they’ve earned a spot in our Hall of Food Truck Fame is their awesome truck. Seriously, guys. 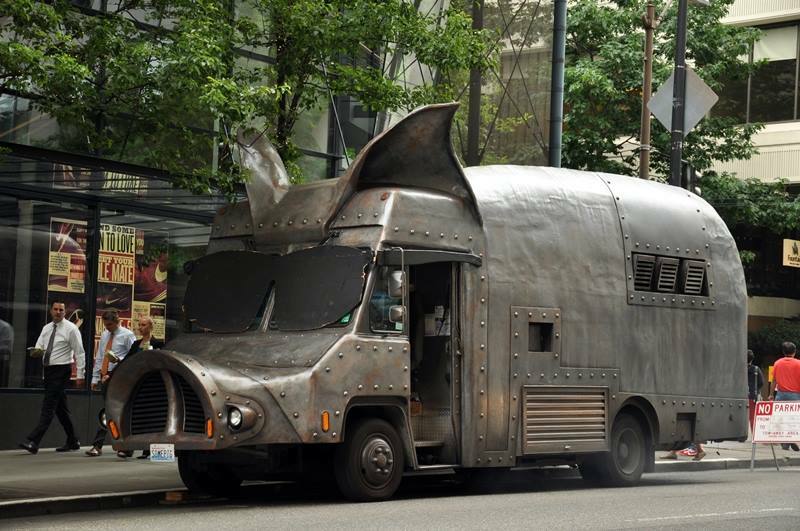 You’ll be hard-pressed to find a cooler food truck rolling around than Seattle’s Maximus/Minimus, because this food truck isn’t just a mobile restaurant—it’s a mobile pig. First off, we love this truck because it’s a great display of the Maximus/Minimus team’s personality. It’s gotta be hard to take yourselves too seriously when you’re driving around in a giant aluminum pig, yet the armor-like design and Latin-sounding name adds just the right amount of tongue-in-cheek pomp and prestige. Of course, this truck design doesn’t just automatically draw attention to the Maximus/Minimus team’s brand—it also draws attention to them, period! Food trucks are naturally pretty eye-catching, particularly when they’re decked out in bright wraps with bold designs. But at the end of the day, a food truck is still a pretty common sight in many major cities—a giant metal pig, though? Not such a typical truck. These FoodTruckrs definitely have one of the most attention-grabbing trucks we’ve ever seen. Finally, this truck doesn’t just catch customers’ attention from the street—it’s also more likely to stick in their minds for weeks and months to come. It takes a truly special meal or experience to make a big enough impression on a customer that he or she is likely to share the story of your truck and return again in the future. The Maximus/Minimus menu still offers those opportunities like any other truck, but they’ve also got a pretty clear reason for people to remember them. We’re willing to bet that a big percentage of their customers have shared the story of getting lunch from a giant pig-shaped food truck cruising the Seattle streets with their friends. We always love to see unique food truck designs, and the Maximus/Minimus truck is undoubtedly one of the most creative vehicles we’ve come across yet. Keep up the great work, guys! You definitely know how to do originality right.